10 years later…sweeter than the first. The joy. The exuberance. The child-like giddyness. The smiles. The hugs. The laughter. 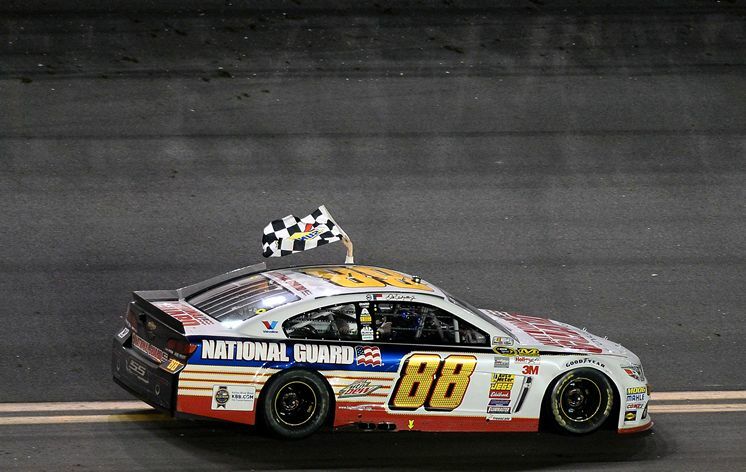 All were present last night as NASCAR’s most beloved, Dale Earnhardt, Jr., won his second Daytona 500, 10 years after winning his first. many skeptics begun to wonder if we had seen his best. Without uttering a word, Junior let his #88 car do all the talking and when it was all said and done, the skeptics were left pondering what new story angle they could come up with. On a night when I had planned to go to bed early so I could go to the gym early, I could not pass up an an opportunity to watch the Daytona 500 under the lights. If you would have visited me last night, you would have found me sitting on my bed squealing and pleading, much to the dismay of my cats, with Junior to hold on to the lead. You would have found me paying that no more wrecks occured. One, because I do not want to see drivers get hurt. Two, because I was tired and ready to go to bed. You would have found me covering my eyes(with two laps to go), hoping that the mysterious black material that attached itself to the front of Junior’s car did not hinder him from keeping his lead. You would have found me dancing, fist pumping and cabbage patching, again much to the dismay of my cats, as Junior raced to the finish line to capture the checkered flag. On a night when I had just hours earlier been ready for bed, I was now too thrilled for sleep. I have followed Junior closely over the years and while I have admittedly been a fan of his, last night pushed my fandom to another level. The joy. The exuberance. The child-like giddyness. The smiles. The hugs. The laughter. 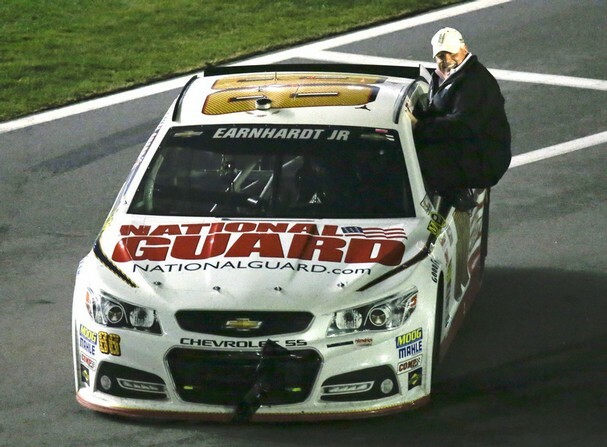 He let his owner, Rick Hendrick ride on the side of the door with him to the celebration. He hugged every one of his crew members before conducting an interview. How could you not be excited for Junior?? The son who has grown up in the spotlight. The son who tragically lost his father with the whole world watching. The son who was expected to take his father’s place as the face of NASCAR(which he has). 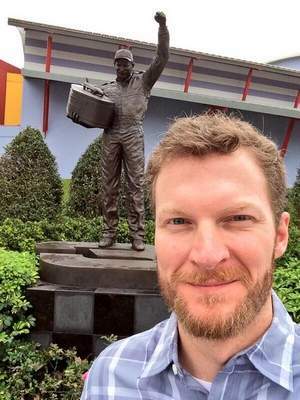 The son who publicly battled his stepmother over the direction of Dale Earnhardt Incorporated. The son who knew all too well the pressures of being the most beloved. The son who despite the pressure has always remained classy, honest and determined. On a day when the #3 car, the one his father, Dale Sr. made famous, returned to the track, it was Junior who proved he belonged in the place he grew up: the track. It was Junior who proved that he was still a force to be reckoned with. It was Junior who proved that perseverance pays off. It was Junior who proved that good guys still finish first. It was Junior who proved that despite the obstacles you face, only you can determine whether or not you make it to Victory Lane. It was Junior who proved he is still the best person to carry on his father’s legacy. 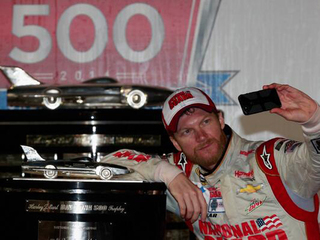 And on yesterday, I am sure his dad, The Intimidator, was smiling up above. My favorite picture :-}. Another selfie. Now that’s subtel! Great to hear from you.